Registration started early for this year’s NCF & PIJLC Open House as the schools opened its doors to over 200 registered guests eager to participate and observe in various language and cultural programs lined-up for the day. From the morning, guests were able to experience how to wear a traditional Japanese summer kimono called Yukata, and try their hand at Furoshiki and Origami (cloth wrapping and paper folding, respectively). NCF teachers also gave beginner lessons on Nihongo with 15-20 people per session for the entire day of the open house. Companies such as FactSet Philippines and John Clements – Professional Staffers also set up their recruitment booths during the event. 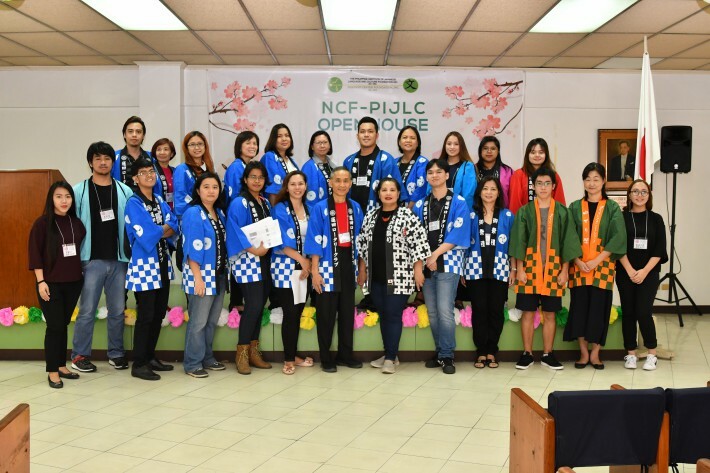 The NCF & PIJLC Open House continues to attract a growing number of visitors especially for some of its much-awaited contests: Karaoke, Cosplay, Kana Writing, and Drawing contest. This year, there were 9 participants in the Karaoke contest all performing popular J-pop hits and Ms. Melody Dela Rosa bagged the top prize for her rendition of “Kaze no Uta” by Minako Honda. Participants for the Cosplay contest also showed up wearing their best costumes but it was Ms. Patricia Santos who received the most votes and won the first prize as the character Mistuha from the anime movie “Kimi no Nawa”. Meanwhile, Ms. Mary Grace Piojo was chosen as the top winner for this year’s Drawing contest and Mr. Sunny Mamaril, Jr. was awarded first place for Kana Writing contest. Towards the end of the afternoon, the school also held a raffle draw for the visitors.